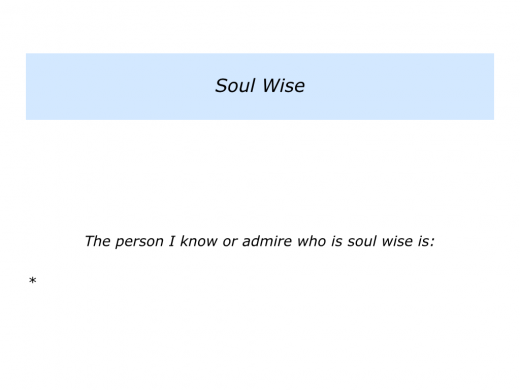 Who do you admire who is soul wise? 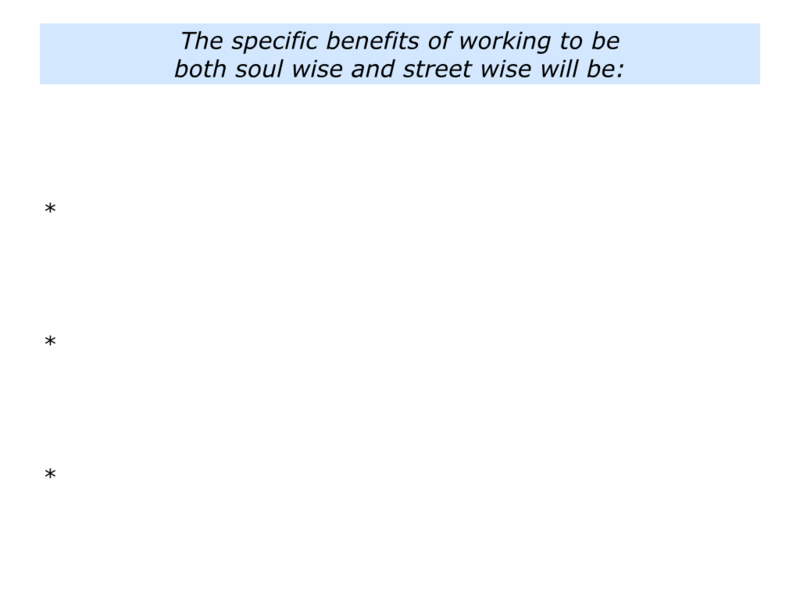 What do they do to demonstrate this wisdom? How do they behave in their daily life and work? Different people give different answers to these questions. 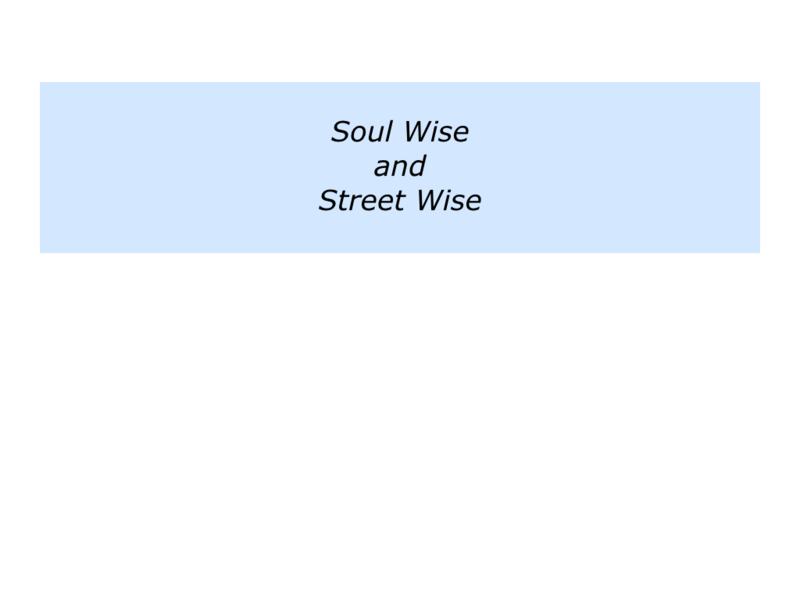 They name people such as the Dalai Lama and Karen Armstrong, who started the Charter For Compassion. 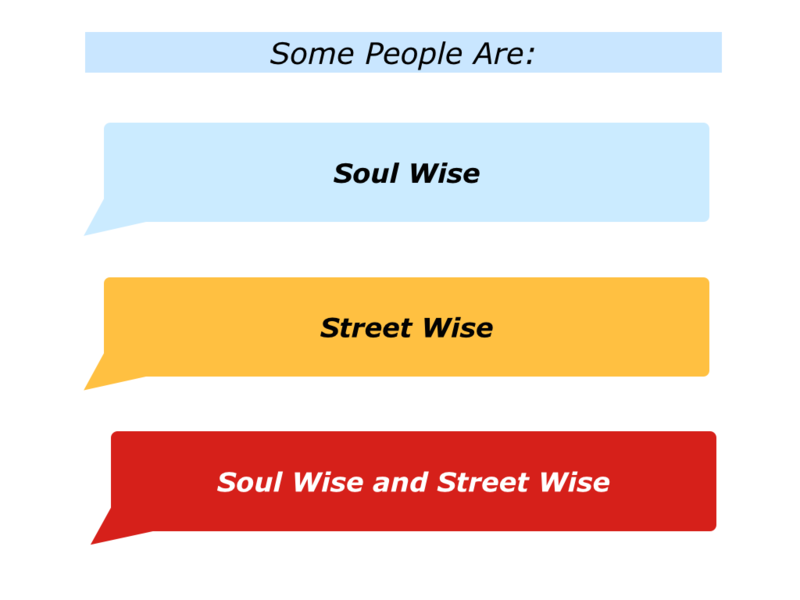 Wise people seem to focus on what is important in life. 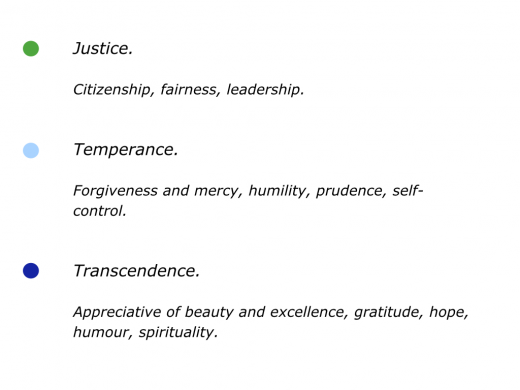 They also demonstrate the common values present in many spiritual traditions. 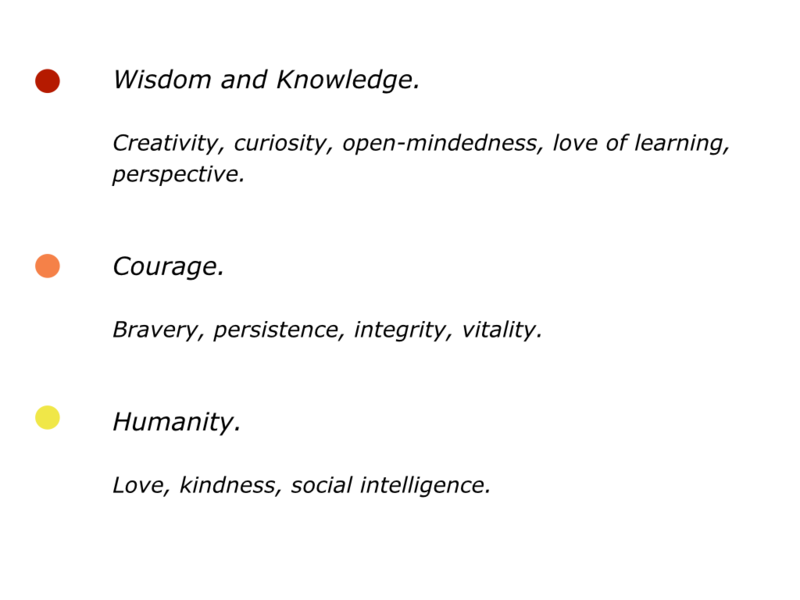 These include qualities such as humility, kindness and generosity. 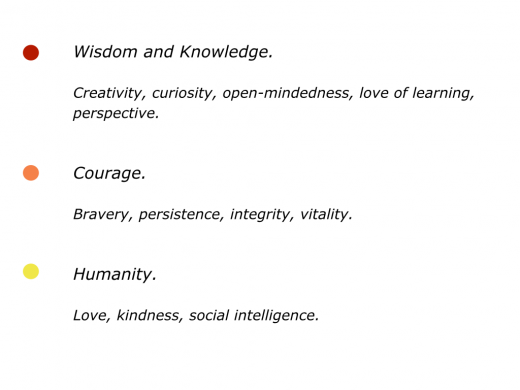 Martin Seligman and Christopher Peterson studied the virtues admired by people in different cultures across the planet. 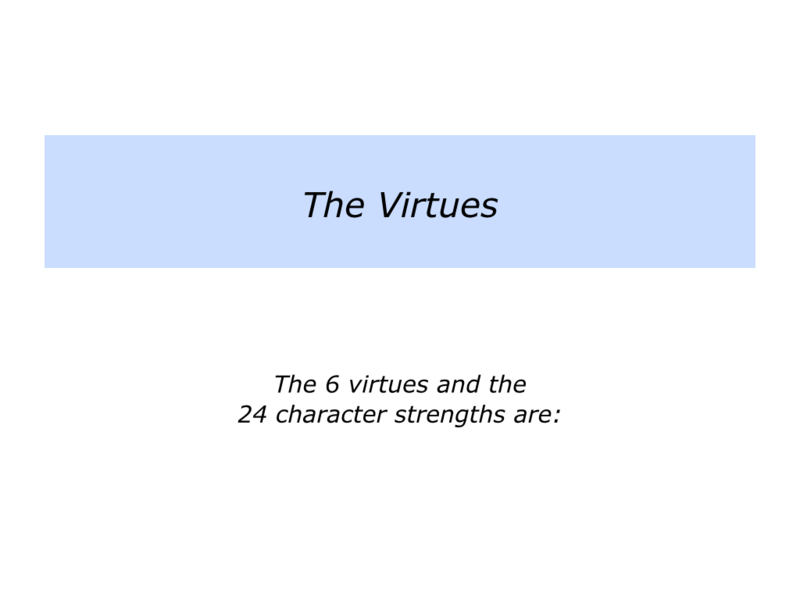 They described these in their book Character Strengths and Virtues. 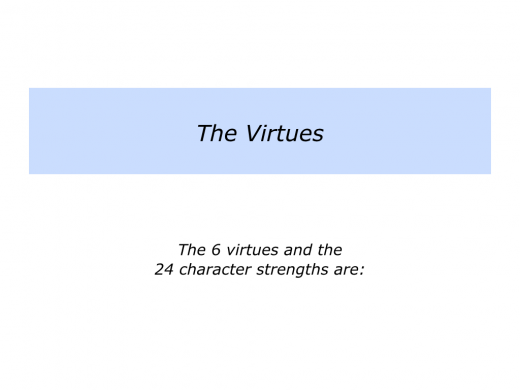 The authors outline six virtues that people admire and each virtue includes several strengths. 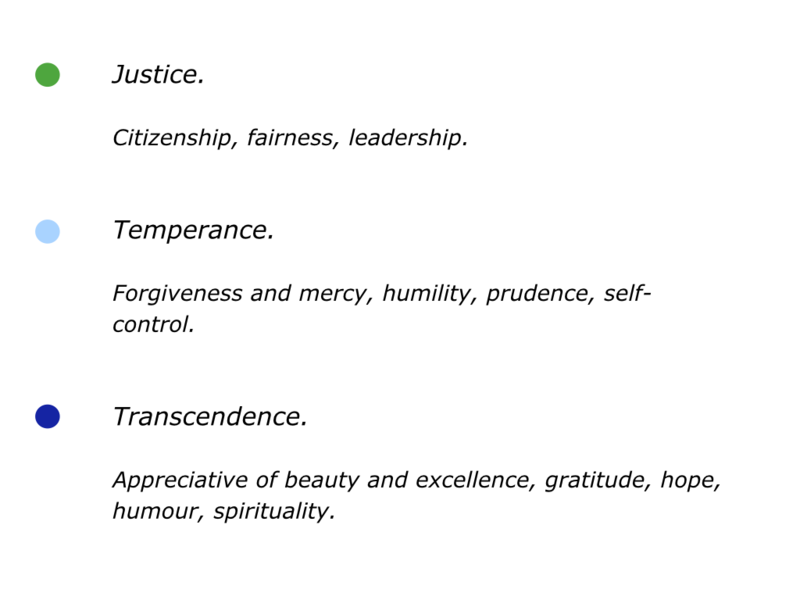 Here is an overview of these qualities. 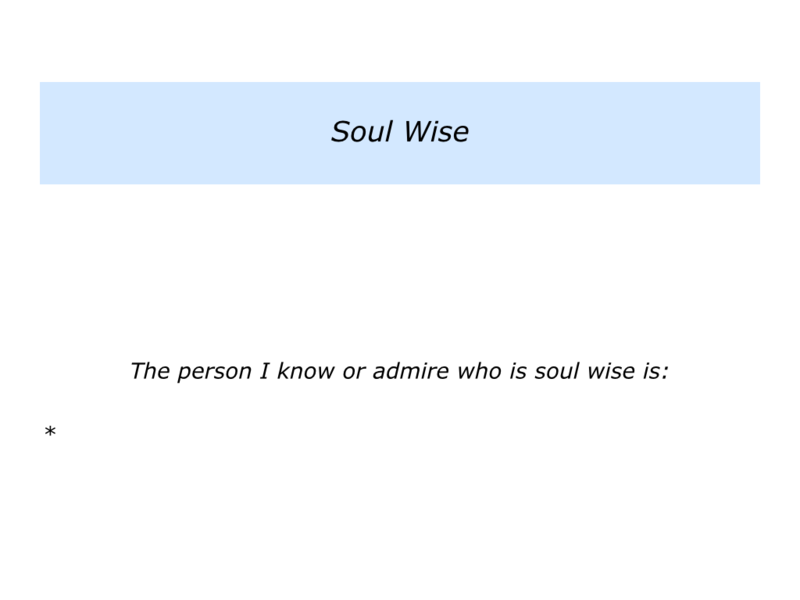 Describe a person you know or admire who is soul wise. 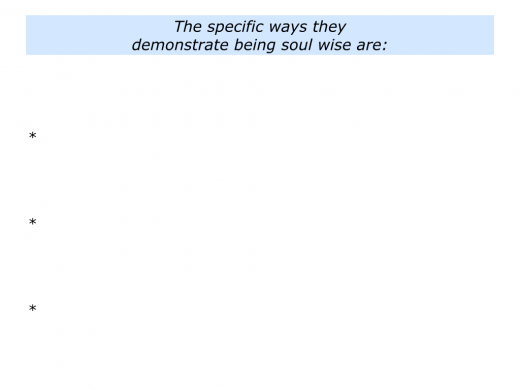 Describe the specific ways they demonstrate being soul wise. Who do you know or admire who is, in an appropriate way, street wise? They know how to operate successfully in their chosen field. 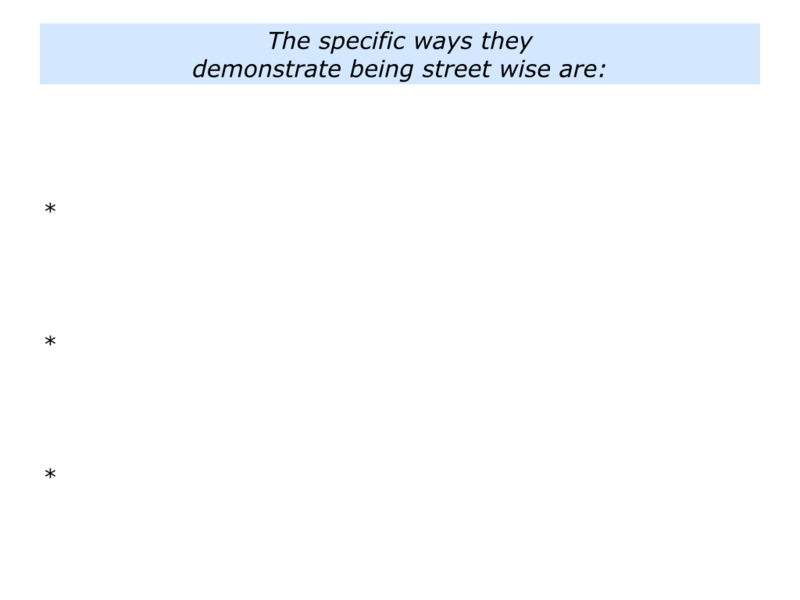 Such people have what Al Siebert, author of The Survivor Personality, called personal radar. They see patterns quickly in the area where they perform best. They seem to know what will happen before it happens. “During our training I noticed that combat survivors have a type of personal radar always on scan. “Anything that happens, or any noise draws a quick, brief look. They have a relaxed awareness. Peak performers in sports, business and many other fields possess a similar quality. 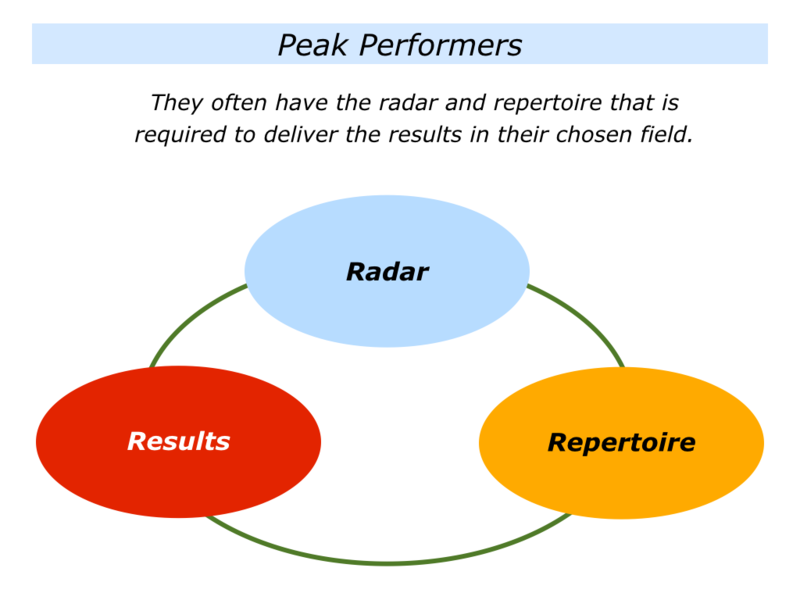 Gathering information from their radar, they then use their repertoire of skills to deliver the required results. 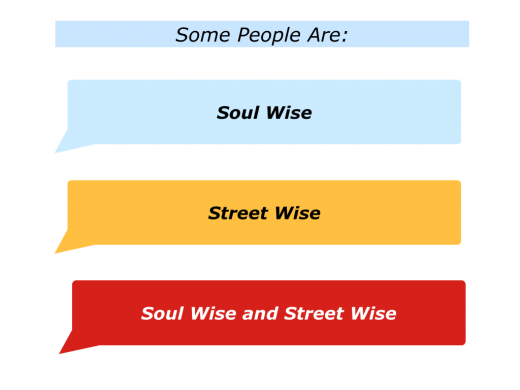 Such people may have such radar – or street wisdom – in their particular field. At the same time, they may sometimes be naïve in other fields. 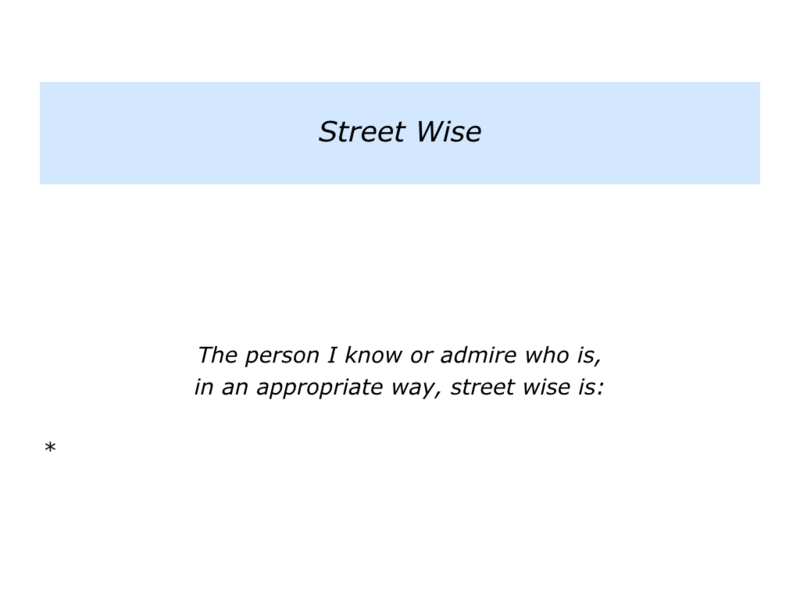 Describe a person you know or admire who is street wise in their chosen field. 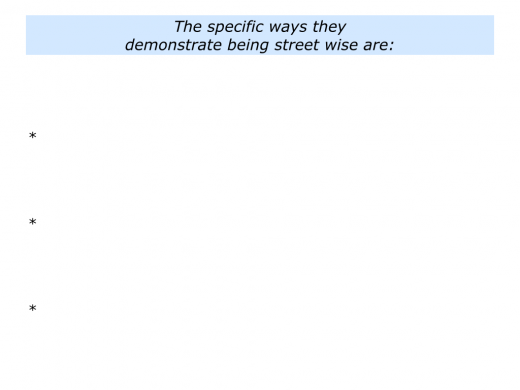 Describe the specific ways they demonstrate being street wise in their field. Alice is somebody who demonstrates both qualities. 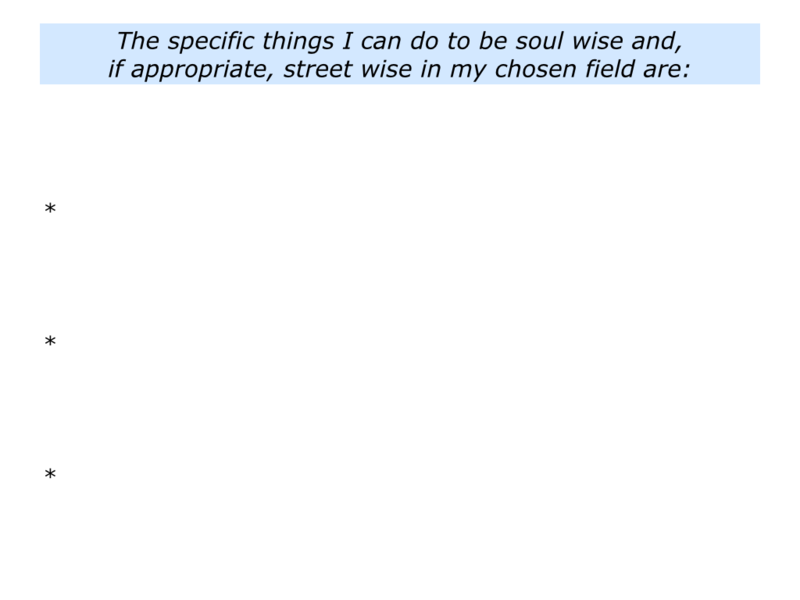 She has both an inner calmness and a zest for life. A lecturer at university, she spends three months a year living with nomadic tribes in the desert. At ease in such wild environments, she also knows how to write proposals to get funding for such academic studies. She studies the transmission of ancient wisdom from generation to generation. This leads to asking questions about her own purpose in life, but she maintains perspective and has a fine sense of humour. Alice grew up in a family that spent time in various countries. This sparked her interest in ancient civilisations. She learned how to read situations quickly and also developed skills to thrive in different cultures. 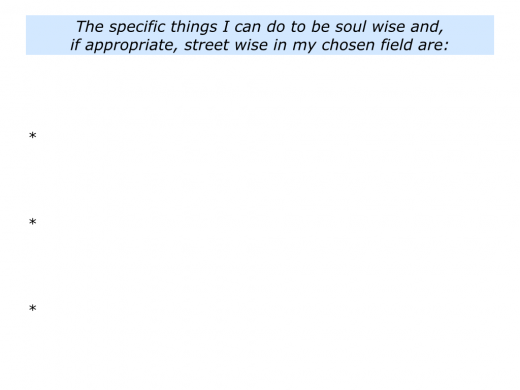 You will, of course, have your own ways of developing as a person and as a professional. If you wish, try tackling the exercise on this theme. This invites you to do the following things. 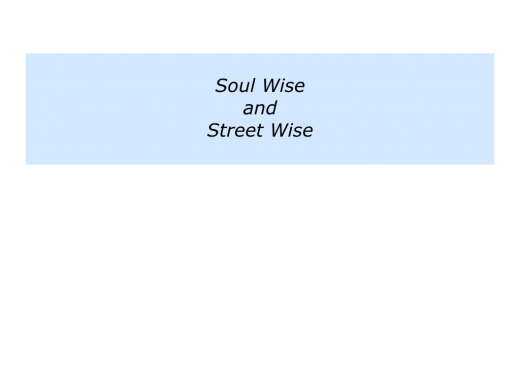 Describe the specific things you can do to continue be soul wise and street wise. 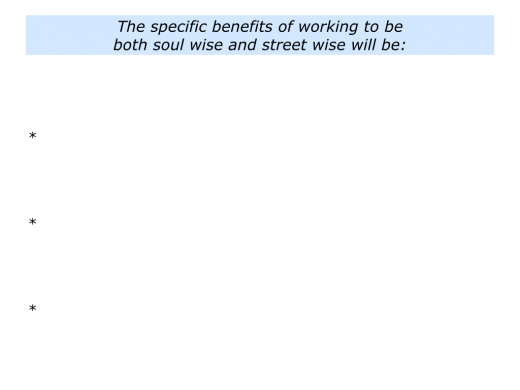 Describe the specific benefits of working to be both soul wise and street wise.